The United States and Russia will begin talks next month on how and when to make cuts in their strategic nuclear arms, despite continued disagreement over an anti-missile treaty, Defense Secretary Donald H. Rumsfeld and Russian Defense Minister Sergei Ivanov announced Monday. "You propose to reduce nuclear arsenals threefold? -- Sure!" Pavel Podvig, an expert with our Center believes, that "...apparently, they counted on that refusing to find a compromise over missile defenses would help Russia put all responsibility for the breakup of the treaty on the US. This goal can be considered as an achieved one (but then, all is not that simple, some suspicions that this was done not without Russian consent, remain). However, what will Russia obtain except of the moral satisfaction? Absolutely nothing..." (Left with a Broken Treaty, - in Russian, by Pavel Podvig, SMI.RU, December 13, 2001). At the Russian START Forum: Russian policy over ABM and strategic nuclear forces, and other topics. Last Tuesday Carnegie Endowment for International Peace held a Special book release luncheon that marked the release of our Center's book Russian Strategic Nuclear Forces, (edited by Pavel Podvig). The Bush administration is aiming to reach a written agreement with Russia over deep cuts in nuclear weapons by the middle of next year even if the two sides fail to close a deal allowing the United States to proceed with testing of a missile defense system. The period of strategic offensive arms reductions provided by the Treaty on Reduction and Limitation of Strategic Offensive Arms (START-1 Treaty) ended on December 5. Although all parties declared fulfillment of their obligations under this Treaty, Russian Foreign Ministry statement stressed that Moscow has questions for Washington "...relating to the fulfillment of a number of obligations under this Treaty". See also Ivan Sidorov's article How Responsible Do The Parties Implement START II? published two years ago (in Russian). 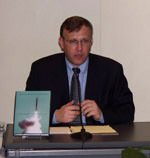 Moscow welcomed the Senate decision of the Parliament of the Republic of Kazakhstan to ratify the Comprehensive Nuclear Test Ban Treaty (Statement By Alexander Yakovenko, The Official Spokesman Of Russia's Ministry Of Foreign Affairs concerning the ratification by the Senate of the Parliament of the Republic of Kazakhstan of the Comprehensive Nuclear Test Ban Treaty, December 6, 2001. Recent Special Supplement to Yadernoye Rasprostraneniye (No 2, 2001) is "The Role of Russian State Duma in Ratification of Treaties over Arms Control and Non-Proliferation of Weapons of Mass Destruction (1994-2001)" by Aleksandr Tarasov, adviser to the State Duma Committee on International Affairs. The possibility of nuclear terrorism remains in the focus of Western media. Most of the observers believe that Russia can be the main source of the leakage of nuclear materials. Statement By Alexander Yakovenko, The Official Spokesman Of Russia's Ministry Of Foreign Affairs regarding adoption by UN General Assembly of a resolution in support of preservation of and compliance with the 1972 ABM Treaty, November 30, 2001. Recurrent Bomb. No Missile Defense Will Save Them From Our "Satan", - in Russian, (by Vladimir Bogdanov, Rossiiskaya Gazeta, November 28, 2001 г.) - an interview with Col.-Gen. Nikolai Chervov, Ret., former Chief of Juridical Directorate of the General Staff of the Soviet Armed Forces. Debates over the outcomes of the November Summit continue. U.S. intelligence agencies have recently concluded that Osama bin Laden and his al Qaeda terrorist network may have made greater strides than previously thought toward obtaining plans or materials to make a crude radiological weapon that would use conventional explosives to spread radioactivity over a wide area, according to U.S. and foreign sources. See also a special section Nuclear Terrorism from Harvard University's "Managing the Atom" project. Russian Minister of Atomic Energy Alexander Rumyantsev and new Head of the US DoE Spenser Abraham, who is on his first official visit to Moscow, discussed the issues of full-scale strategic cooperation. Observers note that a lot of problems piled up in the relations between the two authorities. The Russian weapon-grade plutonium disposition program and HEU-LEU program are not exceptions. Plutonium. What Will Happen To The Treaty? - in Russian, (by Nadezhda Kutepova, Agentstvo Informatsionnogo Vzaimodeistviya, Ozersk, November 29, 2001) - an interview with Georg B. Borisov, Head of a group at the Russian-American committee for handling surplus plutonium, and affiliate of the Bochvar Institute. At the Russian START Forum: elimination of Russian strategic rail-mobile missiles and other topics.